The Washington County Sheriff’s Department removed and destroyed several thousand marijuana plants last week. On Aug. 28 and 29, two helicopters from New York State Police Aviation and the Vermont National Guard Counter Drug Aviation assisted ground personnel in locating numerous patches of the drug. Police spent much of their time in Argyle, Kingsbury and White Creek. Approximately 3,000 plants were removed, about a third of last year’s quantity. Five alleged growers are expected to be charged in the coming days after police determine who is responsible for growing the plants. 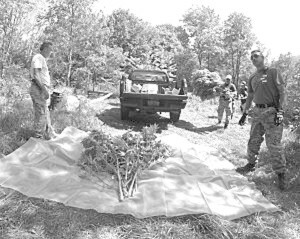 The eradication efforts were part of a collaborative effort that involved many different law enforcement agencies, including New York State Police (CNET), New York State Forest Rangers and En-Con Police, Hudson Falls Police, Glens Falls Police, Cambridge-Greenwich Police, Granville Police, Whitehall Police, Warren County Sheriff’s Office and Washington County Probation Department.